Batteries are something the vape community doesn’t ponder much on. We are all fixated on our mods and tanks, but every smart vaper knows how important a great battery is in getting a great vaping experience. I myself am not too familiar with 18650 batteries. All this time my rule of thumb when it came to buying batteries was stick with Sony VTC 4’s or 5’s only, and nothing under 30 amps! Is it the right thing to do? I couldn’t give you a 100% answer. To be honest I’m really not sure. This led me to do some research on vaping batteries, particularly 18650 lithium batteries for REGULATED mods. Fortunately I came across this video from Pegasus Vapor Academy. This man has tons of useful vape knowledge in his channel so make sure to check him out. Yes, the video is quite long so if you don’t have time to go through the whole video, let me break it down for you. So to answer the million dollar question everyone asks, “What is the best 18650 battery to buy when it comes to vaping?” The answer to that my fellow vapers is there is no such thing as a “best” battery for vaping! Sorry for the letdown, but it’s true. There is NO single 18650 battery that is the all in all, pound for pound battery in the vape world. What you should really be asking yourself when shopping for batteries is this, “What device do I have and how do I vape?” When you know the answers, then you could use this as a basis on what battery to choose. These two things are “amp” (ampere) and “mAh” (milli-Ampere hours). Amps tell how much power the battery can put out, while mAh indicates how long the battery lasts. These are usually indicated on the battery. Now, here’s the kicker. The HIGHER the amperes on a battery are, the LOWER the mAh and vice versa. This means the higher your battery output is, the shorter it lasts. This makes sense because you need more power to charge high-wattage devices which leads to draining your battery faster. How to choose the right 18650 battery for your device? Let’s say you you usually vape at 25 watts on 0.5 resistance. 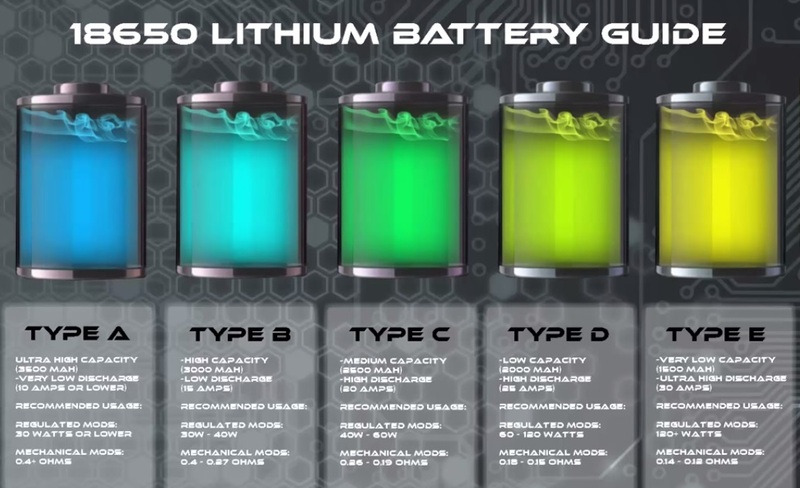 According to the chart, you should use a Type A battery which is a 10 amp/3500 mah. Before I watched the video, my logic in battery shopping was: Let me get the Type E battery. Its 30 amps, which means its puts out A LOT of power therefore supercharging my vape! Uhm no, that is not the case at all when it comes to understanding batteries. That 30amp battery you use vaping at 25-30 watts is USELESS. Whatever your ampere is in battery, it will consistently fire at whatever wattage you set it to. If you have a mod that only goes up to 30 watts max, then it doesn’t make sense to use a 30 amp battery when your mod can only use 10 amp. You want a low ampere battery to make use of the high capacity mAh. This means your battery life will last longer since the battery uses just enough juice to power your device. Warning: this chart does not apply to mechanical mods. It’s really hard to tell with mech mods because it all really depends on how your build is, but to be on the safe side only use high amp batteries with mechanical mods. I hope this video shed some light on understanding 18650 batteries better because it sure did for me.